New paper and two blogs asking "how much data is enough?" My new paper (Impact of satellite imagery spatial resolution on land use classification accuracy and modeled water quality) is essentially an analysis for the Camboriú water fund of how the choice of input data impacts the decision you'd make as a result. We compared a relatively quick analysis on free 30 m resolution data to a more complex analysis using 1 m data. I'd recommend most people skip most of the paper (which is quite technical) and skip to the discussion, or even the two blogs I wrote about it. In short, we found that the simpler analysis would have led us to the same decision in Brazil, but that for other water funds the choice of data could be critical. The return on investment was over 1 with 1m data, but below 1 with 30m data, meaning if financial return was the dominant factor this distinction would be critical. Table 5 and the discussion have several guidelines to consider in how to select whether relatively low or high resolution data is most appropriate for a given context. I'm pretty excited about that part of the paper, and I'd really welcome feedback on it from anyone so inclined. Two significant articles came out in Science in June providing evidence for how neonicotinoids (a type of pesticide used for crop protection) are harming bees in field trials (there is some nuance, but the findings are concerning); I'm including reviews of those plus a few other articles on the topic of pesticides and bees. Read to the end for an article of cattle intensification in Brazil, and a plea for scientists to write journal articles as if they wanted human beings to actually read and understand them. If you don't want to read the two new studies, here are three stories about them (the one in the Guardian has more quotes from Syngenta pushing back on the findings, the Greenpeace one has a response to that critique from one of the lead authors). As background, it may help to know that in addition to honeybees (which most people are familiar with, they live in large hives) there are bumblebees (which live in much smaller colonies), and solitary wild bees (like the one shown in the photo above, taken in my garden). So when we talk about impacts of neonicotinoids or other pesticides (fungicides, other insecticides) on bees they are sometimes split by impacts on the colony (whether the colony dies out or not), lethal impacts on individual bees, and sublethal impacts (see below for details). So the science here is much broader than just colony collapse disorder in honeybees, which makes the results a bit more complex. For this summary I'm focusing only on bees as there is less science on impacts on other pollinators like butterflies and flies. Tsvetkov et al. 2017 has three significant findings. The first is that some (not all) apiaries >3km from fields planted with neonicotinoid-treated seed still show neonicotinoids; the pollen analysis indicates that the contaminated pollen is coming from wildflowers (meaning that the neonicotinoids are being taken up by untreated plants relatively far from where the pesticide is applied). The second is that the lethality of neonicotinoids (clothianidin and thiamethoxam in this case) is significantly higher in the presence of a common fungicide called boscalid; boscalid on its own didn't harm bees but it made two neonicotinoids roughly twice as toxic when both pesticides were present in the same field. Third, they demonstrated several specific negative impacts on bees (mortality, "queenlessness," and declines in hygenic behavior) of exposure in the field to neonicotinoids at realistic doses. What makes this study different from earlier work showing harm is that rather than being lab-based they studied actual realistic doses and duration of exposure in the field. The best response to this research is tricky; simply banning neonicotinoids could potentially cause a shift to other pesticides that have been less studied (and may or may not be less toxic), and additional crop losses could potentially drive up food prices and lead to more habitat conversion. So more analysis on the trade-offs is needed, but this also appears to be the strongest evidence yet that in the real world neonicotinoids are harming bees (along with several other factors increasing their susceptibility). Rundlöf et al. 2015 is another important study of how neonicotinoids affect bees under real field conditions (as distinct from bees artificially fed neonicotinoids). They found impacts on wild bees (reduced density, total elimination of solitary bee nesting, and reduced bumblebee colony growth and reproduction) but did NOT see impacts on honeybees (unlike Tsvetkov). 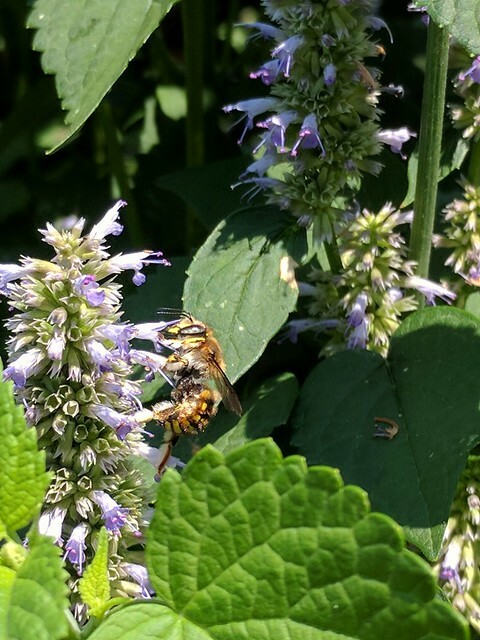 The authors note that some other research has found that honeybees do better than bumblebees with detoxifying after neonicotinoid exposure, and they also found bumblebees collected a higher percentage of pollen from the crop. Specifically this study looked at the neonicotinoid clothianidin in combination with the pyrethroid (insecticide) b-cyfluthrin and the fungicide thiram, based on common practice in Sweden. Traynor et al. 2016 is another real-world study that looked at exposure to pesticides (measured by sampling bees, beeswax, and pollen) and how that related to colony survival and queen replacement. This is a complicated one so be warned. They found residues of 93 pesticides, and they provide detailed breakdowns of how common each one was, and how toxic it was to bees at the level detected (estimated via "hazard quotient" or HQ which is a model of lethality). Unsurprisingly, they found that when different pesticides that have the same method of action (e.g. lumping organophosphates together as they work the same way) occured in the same sample they had a stronger effect. In addition to hazard quotient, they considered total number of pesticides each colony was exposed to, and the number of "relevant" pesticides (the ones at high enough levels they are expected to have a significant effect on bee mortality), and several different ways to measure impacts (it's a rich data set) but primarily having to do with lethality and queen replacement (they don't have the suite of sublethal effects the studies above report on). Anyway, the findings are complicated but they found a strong relationship between the total number of "relevant" pesticides and colony mortality within a month, overall number of pesticides exposed to over the study period was related to colony survival, and HQ was related to queen replacement. The strange thing is that this is a very simplistic model (as the authors acknowledge) but the findings could indicate that there are synergies between pesticides that are currently not well understood. Note that they did NOT find significant concentrations of neonicotinoids in the colony, which on the one hand means they couldn't evaluate the impact on colony health, but on the other hand simply finding low doses in hives is arguably good news. They DID find significant risk from two groups of fungicides (including chlorothalonil) and an insecticide group generally considered "bee-safe" (ecdysone receptor agonists). My take away from this study is that there are likely a ton of confounding effects and syngergies in these real-world studies, and that similar to the finding of Tsvetkov with boscalid and neonicotinoids together being much more toxic than separately, there are likely other combinations we're not aware of. This emphasizes the need for both lab studies to evaluate single chemicals in a controlled environment, but also more real-world studies which get at actual risk but will tend to have a lot more variation. Simon-Delso et al. 2014 is a Belgian study similar to Traynor, comparing healthy honeybee colonies to colonies with a variety of disorders (e.g. dying out, queen loss, etc.) and looking for possible drivers or associated factors. They found that the virus load was not different between healthy and disordered colonies, and they did not see a relationship between disorders and the total number of insecticides or the total pesticide load (µg/kg). However, they did find a strong relationship between the number of fungicides present and disorders: they built a model estimating that ~26% of colonies without any fungicide would have disorders, vs. ~88% of colonies with 4 different fungicides. They also found that higher cropland area near the apiary increased the chance of disorders, while higher grassland area decreased it. Boscalid, cyprodinil, iprodione, and pyrimethanil were the most commonly detected fungicides; some of these are known to have synergistic effects with some insecticides, and/or to have metabolites which are significantly more toxic than the original formulation. There's one more really interesting aspect to this research I couldn't resist including, as it provides a provocative twist. There has been a lot of debate and attention to the role of disesase in honeybee colony disorders, in paritcular viruses introduced via Varroa mites (as well as unrelated pathogens like Nosema ceranae). Sánchez-Bayo et al. 2016 is a review summarizing evidence that insecticides (neonicotinoids and fipronil) actually suppress the immune system of bees, so it's not as simple as asking whether the problem is insecticides or disease given the potential synergy. They reinforce the challenges in studying the impacts of a single stressor like neonicotinoids given relationships between Varroa mites, viruses, fungicides, insecticides, and other stressors. This is a well-written and engaging article, and if you're interested in bee diseases it'll be worth your time. If you're short on time skip to Figure 1 (a flow chart of how different stressors are related). Doubleday and Connell 2017 argue that if scientists put more effort into writing well (not just accurately, but clearly and in a way that captivates readers) it would save us all time in reading these articles, and facilitate better understanding and collaboration. It's not a new point, but they make it well, and I especially like how they provide an alternative version of their abstract written in "The Official Style." They also do a good job talking scientists down from the immediate reaction that writing well means stooping to sensationalism, and provide good examples of the middle path. When I read articles like this, I am inspired, but I definitely will need help in actually overhauling my science papers prior to submission into something that would read well for a broad audience (but will not trigger peer reviewers to dismiss the paper as fluff). I imagine many of the non-scientists reading these summaries would be thrilled if the studies listed were easier to digest! Merry, F., & Soares-filho, B. (2017). Will intensification of beef production deliver conservation outcomes in the Brazilian Amazon? Elementa: Science of the Anthropocene, 5(24). Tsvetkov, N., Sood, K., Patel, H. S., Malena, D. A., Gajiwala, P. H., Maciukiewicz, P., … Zayed, A. (2017). Chronic exposure to neonicotinoids reduces honey bee health near corn crops. Science, 356(6345), 1395–1397. Woodcock, B. A., Bullock, J. M., Shore, R. F., Heard, M. S., Pereira, M. G., Redhead, J., … Pywell, R. F. (2017). Country-specific effects of neonicotinoid pesticides on honey bees and wild bees. Science, 356(6345), 1393–1395.